Iterable is the future of email marketing with a seamless user interface for personalized messaging. This online platform helps in sales and promotion. It is specifically made to engage users through multiple channels and well-structured communication. It lets you design multi-tier campaigns which would otherwise eat up all your budget and time. Iterable makes such campaigns and promotions easy and efficient and saves your time and money. The tool is featured in Forbes, The Wall Street Journal, TechCrunch, and VentureBeat. Modern digital marketers love to work with Iterable because it allows them to achieve their marketing goals while observing the budget constraints. Due to the benefits Iterable provides, it is highly praised and sought after by today’s digital marketers. It allows you to select seamlessly between mobile push notification, SMS, and email based on what a customer does on your app, your site or in past campaigns. Iterable has made it very easy for digital marketers to initiate and run campaigns. These triggered campaigns or targeted blasts may increase user engagement to amazing levels. Such campaigns can be run for one or more market segments, using the same set of tools. Iterable sends SMS, emails and push notifications to customers to remind them of your presence. No matter what the mode of communication is, Iterable works best for all. With Iterable you can prepare customized messages and schedule them for a specific time in future. One of the major reasons for Iterable’s success is its ability to handle all types of messages across all channels. The tool is also used to build complicated workflows in a matter of minutes without using any codes. This makes it easy-to- use since you can easily perform your task without being proficient in programming. Your sales team would also be able to handle it without any training. Iterable’s Workflow Designer makes it insignificant to introduce delays, trigger another workflow, run filters and kick off actions. With Iterable you can easily optimize and test everything in your campaigns all by yourself. Finally, Iterable offers you a 360-degree view of customers with the help of a flexible data model. It helps in creating groups of customers with similar attributes. This market segmentation provides a basis for taking important marketing decisions in future. There are popular and widely used solutions in each software category. But are they automatically the best fit for your organization’s unique requirements? A market-leading software application may have thousands of users, but does it provide what you require? For this reason, do not blindly spend on popular systems. Read at least a few Iterable reviews and consider the factors that you desire in the software such as the cost, main tools, available integrations etc. Then, choose a few systems that fit your needs. Try out the free trials of these products, read online comments, get information from the seller, and do your research thoroughly. This profound research is sure to aid you select the finest software platform for your company’s special requirements. How Much Does Iterable Cost? Iterable’s payment scheme is a subscription based one, meaning that the price will depend on the number of users and messages shared on the Iterable platform. Please contact the company for more information. We realize that when you make a decision to buy Marketing Software it’s important not only to see how experts evaluate it in their reviews, but also to find out if the real people and companies that buy it are actually satisfied with the product. That’s why we’ve created our behavior-based Customer Satisfaction Algorithm™ that gathers customer reviews, comments and Iterable reviews across a wide range of social media sites. The data is then presented in an easy to digest form showing how many people had positive and negative experience with Iterable. With that information at hand you should be equipped to make an informed buying decision that you won’t regret. A recommended marketing tool for growth you'll end using! Iterable happens to be the very one in its class out there. A platform that's easy to use and armed with excellent support. What are Iterable pricing details? What integrations are available for Iterable? Pros: The biggest selling point of all is the product itself. Its e-mail integration and push gave us a single medium to message users. Its players offer e-mail and push. Iterable has a well-rounded and developed e-mail service. It offers an ideal blueprint for advancements in the future. Cons: It main data key is the e-mail address of the user instead of a user ID or anything else that a customer can determine. It pushed our developers to come up with some hackable solutions. Pros: Its workflow tool lets us manipulate complex rules that would've been difficult to do. If it wasn't for Iterable, it would taken months to accomplish the required engineering work involved with another ESP. It's data export is simple to use in creating customize dashboards that updates us on the progress of our campaigns. Handlebars has little learning curve and can easily be done. Cons: Certain basic features weren't found as the product is still in the middle of development. Some tasks weren't intuitive. This led to small bugs within our system. For instance, we had to make template edits in the campaign instead of directly editing from the template itself. 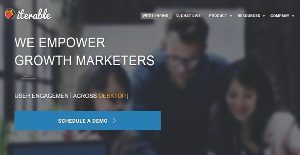 A CRM tool that can be customized and works great for both marketing managers and developers. Customer service has been excellent. I love their customer support. Response times were really quickly. I favor their platform. It has enough simple APIs for me to create whenever I feel like it. If you need more information about Iterable or you simply have a question let us know what you need and we’ll forward your request directly to the vendor.